At 85, the legendary Hockey Night in Canada play by play man just lets his work do the talking. READ THE REST OF THIS PROVINCE SPORTS STORY HERE. 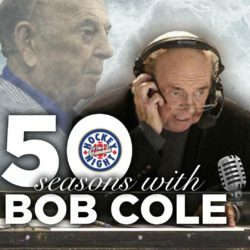 SEE BOB COLE FEATURED WITH SIDNEY CROSBY & SCOTT OAKE ON CBC’s ‘AFTER HOURS’ HERE. Thanks for your years of service Mr. Cole. I was just going through my video archive and found a video I had called Great Plays From Great Games (1989 Molstar Productions) and watched it with a buddy of mine. The various hi-lites were of games obviously up to 1989. The play by play hosts were either the late great Danny Gallivan, the late great Dan Kelly and yes including one alive and kicking Bob Cole. To think Bob has been doing hockey play by play for 50 years is just great. CONGRATS BOB! When you do your last game, do it with flair and enjoy the new found time you have. Maybe write a book of memoirs.